Millions of children around the world are born into a stark reality: will they work in markets and mines, or go to school? Will they be trafficked into slavery, or be free? Will they be child soldiers, or students? Many children grow up in a daily life marked by violence; the images of war, abuse, persecution and loss of family. These traumatized children suffer depression, nightmares, loss of self-worth and often are the source of future aggression. Each year an estimated 15 million children die of hunger. A lot of children in Asia are deprived from their rights and are forced to labour or violence. These children regardless of their nationality should have the rights to education, rights to health, rights to nutritive diet, rights to water, rights to care, and all other rights associated to human. 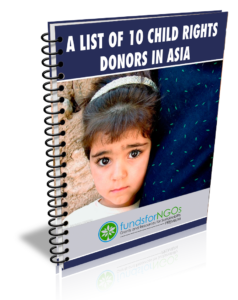 Download this resource guide on “A List of 10 Child Rights Donors in Asia” available exclusively for our premium members.